Looking for the latest and greatest in equipment? 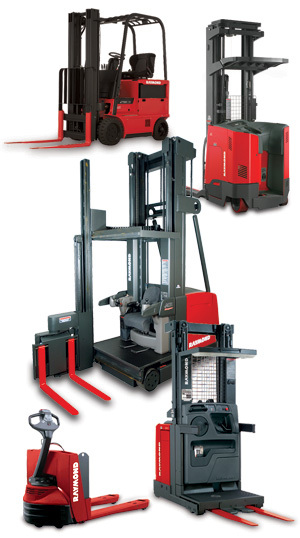 ReconditionedForklifts.com can supply you with the equipment to help maintain your business. When you purchase used or reconditioned forklifts, you have a right to know exactly what you are paying for. This is why all of the used forklifts we offer are given an exhaustive inspection before they are offered for sale. The results of these inspections are clearly indicated on all of our used lift trucks. In addition, Reconditioned Forklifts offers three levels of quality assurance for you to choose from. Level One - "As Is"
Level One "As Is" used forklifts have been inspected but not serviced by our service technicians. Some of these can be made operational if the required repairs are undertaken while others may be deemed useable for parts only by our service technicians. No guarantees or warranties, expressed or implied, are given for "As Is" used lift trucks, but they will be priced according to our technicians' recommendations. "As Is" used forklift trucks for sale can be great value for customers who have their own in house repair technicians or need parts for an existing forklift. Level Two Operational Guarantee used lift trucks have been deemed to be sufficiently operational to be used in day-to-day operations. These used forklifts have been thoroughly inspected by our service technicians and repaired as needed to ensure they can be safely used upon delivery. They do not, however, come with an extended warranty. The buyer will be fully informed about any defects that exist and all repairs that have been undertaken and so can make an informed decision about his purchase. Level Three reconditioned forklifts from Reconditioned Forklifts are Toyota Certified Reconditioned Forklifts. These forklifts have undergone a thorough 103 point inspection process as required by Toyota Materials Handling USA (TMHU) and are only available through authorized dealers like Reconditioned Forklifts. Toyota Certified used lift trucks are backed by Toyota's 1 Year/2000 hour warranty. Older forklifts are covered by Toyota's Powertrain Service Agreement, while lift trucks less than 6 years old and with less than 12,000 hours of use behind them qualify for the more comprehensive Carriage-to-Counterweight Service Agreement. Both of these agreements cover parts and service to the engine, transmission and differential parts as well as drive motors, gear cases and the controls of electric powered trucks. The Carriage-to-Counterweight Service Agreement covers many other areas not covered by the Powertrain Service Agreement for older used lift trucks. If you need further clarification about our Service Agreements or the Toyota Certified Reconditioned Service Agreements, please don't hesitate to Contact Us. We strictly adhere to a policy of full transparency and total disclosure. Our goal is for our customers to know exactly what they are getting when they buy a used forklift from Reconditioned Forklifts and to get the best possible used forklift for their needs. You may also contact Customer Support via email at support@bahrns.com. Reconditioned Forklifts, Div. of Bahrns Equipment Inc.